The nine forms of Goddess Durga are worshipped during ‘Navratri’or ‘Navrtras’. Hindus all over, worship Goddess Durga and her nine forms indifferent ways. The ‘Navratra’ festival is celebrated with great zeal and enthusiasm by all devotees. 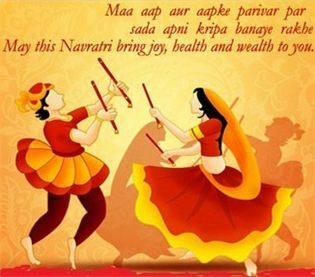 ‘Navratri’ is associated with the victory of good on the evil. This year first day of Aashwin Navratri, 2013 also called Aashwin Shukla Pratipada is falling on October 5, i.e. Aashwin Navratri, 2013 is starting on October 5. This Navaratri will end on Aashwin Shukla Navami on October 13. In these nine days, our scriptures have prescribed for special worship/ Pooja of Goddess ‘MA Durga’. People place the idol of Goddess Durga and ‘Matkaa’/’Ghat’(pot) during this period. They light the ‘Akhand Jyot’ (‘diya’ that burns for nine days) during this time. As per tradition, a pitcher or water pot, called Kalash or Ghat in Sanskrit/ Hindi is placed on the first day of Navaratri, at some auspicious moment. On the eve of ‘Navratra’ I am mentioning ‘Kalash Sthapana’or‘Ghat Sthapana’ and ‘Akhand Jyot’ procedure as per Vastu which is based on five elements and these five elements are governed by ‘MA Durga’. ‘Kalash’represents Earth and Water element.A ‘Kalash’ is believed to be a symbolic form of ‘MA Durga’ enchanting auspiciousness during ‘Navratras’.Keeping the ‘Kalash’ in the home invokes positivity everywhere. This ‘Kalash’must not be touched during the nine days. Take an earthen clay pitcher (‘Matkaa’), fill it with clean water and put some rose petals, one silver coin and one penny in it; then cover it with clay pot lid and tie a ‘Raksha’ thread (‘Moli’/’Kalavaa’) around the neck of this earthen pot. Thereafter, fill rice in the clay pot lid above this ‘Matkaa’ and place a raw coconut covered in red cloth or red ‘Chunri’ at this ‘Kalash’. ‘Jyoti’represents ‘Fire’, ‘Air’ and ‘Space’ elementssince lighting of the ‘Jyot’ emanates brightness in the room/house (’Space) and the fragrance (‘Fumes’) which purifies the ‘air’. In ‘Navratras lighting of ‘Akhand Jyot’/ ‘Deep’ or an earthen lamp is an essential part of the prayer rituals (‘puja’) since the flame of the lamp and ‘jyoti’ has two significant qualities. First it banishes darkness and the secondly it is always upward/upright. The upward movement of the ‘Jyoti’ signifies the path of wisdom and the path of divinity. 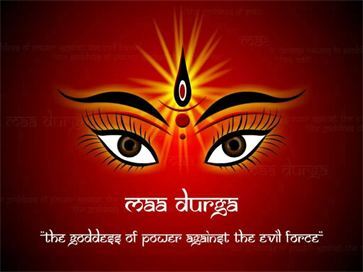 Flame also signifies the power of all the beings so it is also considered as form of MA Durga. Without ‘Fire Element’ or ‘Shakti’ no one can survive in this universe.It is believed that where daily ‘jyoti’ is lighted regularly especially at the time of ‘Navratras’, there can never be the darkness or evil forces at such dwellingplaces. Mix saffron (‘Kesar’) and turmeric powder (‘Haldi’) in pure ‘Ghee’(Clarified Butter) and use this ‘ghee’ only for the ‘Jyot’ during ‘Navratras’and while preparing ‘jyot’ always put ‘Chhoti Elaichi’ (Green Cardamom) in itvand offer this to MA Durga. Worshipping in Navratri is a way to enhance our non-physical approach and make our goddess happy to be at home fulfilling our wishes. Meditation is most authentic way to get involved with God and improve our ‘karmic’ deeds. This worship will be more successful when our offering would be done with practical aspect in proper direction. Vastu Shastra is a science which can lend you every earthly joy if its principles are followed with utmost trust. 1. ‘Ishaan kone’ (North-East) is considered as the directionof Gods. This is the best place to keep Goddess MA Durga’s idol in this direction. 2. If you are lighting ‘Akhand Jyot’ before the idol then keep it in the ‘Agneya kone’ (South-East). 3. Make sure you face east or north while performing the puja. 4. Make sure you clean up that area and there is no dirty clothes lying around the puja area. 5. Never place the idol near bathroom or restroom. 6. Leave some place near the puja area to sit. 5th October 2013,Navratri: Festival of the nine nights begins. Navratri’s each night is dedicated to one form of Goddess Durga. That is every ‘ratri’ of the ‘Navratri’ corresponds to worship of different forms of MA Durga. MA Sidhidaarti, who is a treasure house ofMystic Powers (Yantra Tantra) and Knowledge (Gyaan). I wish may ‘MA Durga’ shower abundant wisdom, happiness, peace,health and prosperity on you and your family on this auspicious occasion of ‘NAVRATRAS’.Good Wishes for a joyous ‘Navratri’ and a Happy New Year with a plenty of ‘Peace and Prosperity’. May this festival bethe harbinger of joy and prosperity! As the holy occasion of ‘Navratri’ is here and the atmosphere is filled with the spirit of mirth and love, it is prayed that this festival will be great for you! “Maa Durga Se Vinti Hai Ki Aapke Jeevan Main Sukh, Smriddhi, Dhan, Yash, Pradaan Kare”.